A few months ago I decided to go all in on the vSphere Web Client. I was one of those people that wasn’t a huge fan of ESXi when the Service Console was dropped, so I decided to take a different approach here and embrace it. The verdict? I like it. A lot. I’ve gotten so used to it, that when @DiscoPosse and I tried to do a Test Track at VMworld, I had a bad time. I kept on saying “but I know exactly how to do this in the Web Client!”, and of course, it was iSCSI. So it was a really bad time. As I write this and wait for my vCenter to reboot, I’m actually using the C# Client to access the host, and I can’t wait to get back to the web client. I agree with many of you out there that when it first hit, the Web Client was pretty abysmal. Clunky and temperamental were the best words to describe it, and I pretty much went back to my beloved C# Client. Once I got a 5.5 environment going, I started playing with it. I use a Mac, and it was nice to not have to RDP into a desktop just to access a vSphere environment. That became a huge plus for me. Also, I know a lot of us out there like to complain that it is slower than the C# client, and hopefully that is fixed soon, but the fact remains, it works well on really bad internet connections. Like tethered to your phone with horrible signal. There are some things the Web Client hasn’t quite done so far, and one of them has just been resolved. Site Recovery Manager 5.8 just became GA, and guess what, full Web Client integration! I can see this being a huge struggle for any vSphere admin who uses SRM in their environment. As I learned at Test Track, once you’ve used the Web Client enough, you’ll slow down a enough to be annoyed with the C# client. This could have been a major operational issue for moving towards the Web Client. 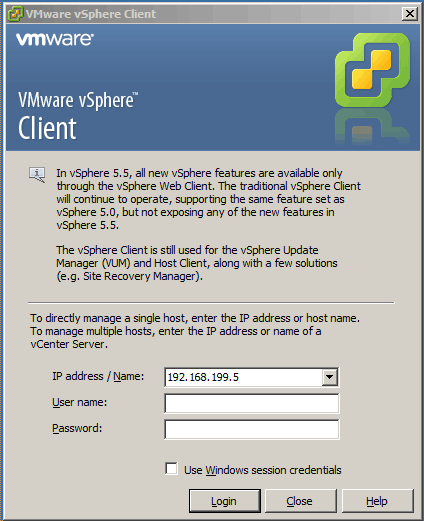 The other major thing missing from the Web Client is vSphere Update Manager. The question then must be asked, do I really need vSphere Update Manager? To me, the answer is no. I’ve been a big fan of AutoDeploy since it first came out, so that would handle my hosts for me. For my VMware Tools and Virtual Hardware Updates I can use vCenter Orchestrator, because, why not? Simon Sparks has a ton of great vCO resources on his website, including how to do just this. The Web Client also provides enhanced integration with vCO. Let’s take a look at a couple more of the Web Client features that I think make the move worth it. First of all, let’s talk the pause button, or Work in Progress. How many times have we all gotten half way through something, before we’ve had to quit out of the whole thing to check something. Or we’ve gotten something dropped on us and had to abandon things mid task. Work in Progress fixes this, I just click out side of my window, and it is sent there. Double click it, and it comes back just where I left it. This is a huge time saver, and it also lets me work on multiple things at once! Work in Progress is located between Recent Tasks and Alarms. I actually don’t mind recent tasks on the right hand side, but I know a lot of people have really missed it from where it used to reside on the bottom of the window. I can see how this bothers people, and how our screen real estate may be better served by moving it back to where it used to live. Who know, this may even happen in a future relase of vSphere, and help people make the jump from the C# Client to the Web Client by keeping some things more familiar. How about the biggest vSphere cheat ever? Right click context on objects. Everywhere. Across anything. From anywhere. I personally love to be able to do almost anything by right clicking a given object. It saves a lot of time by not having to browse through multiple menus. Now, for a bonus. For some strange reason, I can never mentally remember where I have to go to configure vSphere SSO. I always click on Administration from the home screen, go through all of the options, and never find what I actually need. Or, I click on Roles from the home screen, thinking it could be there too. Wrong! What you really need, is to click on Mange from your vCenter server itself. I know, it seems a little weird that you’re managing your vCenter from your vCenter sometimes, but that’s where it is. As you can also see, I follow Melissa’s Worst Practices in my lab, and just make myself a domain admin account and give domain admins access to everything. Don’t try this at home! 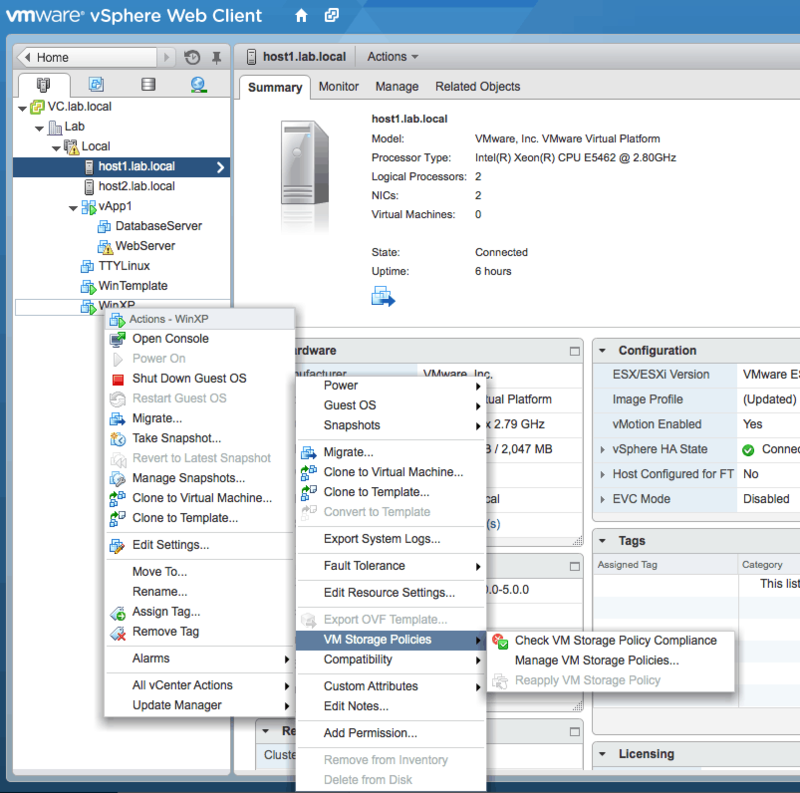 So why use the vSphere Web Client? You get all the cool new features of vSphere, you can get interrupted endlessly and pick up right where you left out, and you can use it from your Mac or Linux machine. It’s also the way of the future, so we might as well get used to it. Who knows, perhaps our patience will be rewarded and it will be even better with the next release of vSphere. You actually have to use Chrome/ium under Linux to get the required Flash version.